Our plush, recordable talking Grandma dolls, stitched with love and care, remind our little ones of all the tender moments they share with their grandmothers. These unique dolls come with their own storybooks and a purse in which to keep pictures of a favorite grandchild. Your child will love curling up with you and Grandma to share stories and learn more about their heritage! Mamita has the unique ability to allow you to record your words in your own voice for playback. To record voice, click the 'How to record your voice' tab below! Batteries are included, click 'Battery info' tab for more info! To record voice, open velcro in the back of the dress. Pull out the box. Attached to the box is a wire with a small, circular button. Press the button to begin recording, and speak clearly into the voice box. Press the circular button again when finished recording. CAREFULLY put the button and voice box back into the doll. (Be sure not to press the circular button again while placing it back into the doll. If this happens, you'll need to re-record your message.) Squeeze the doll's hand to hear your message! Here is a video demonstration on how to record your voice in your Grandmas2share doll. Grandmas2share dolls require 3 LR44 batteries that are included with your doll. 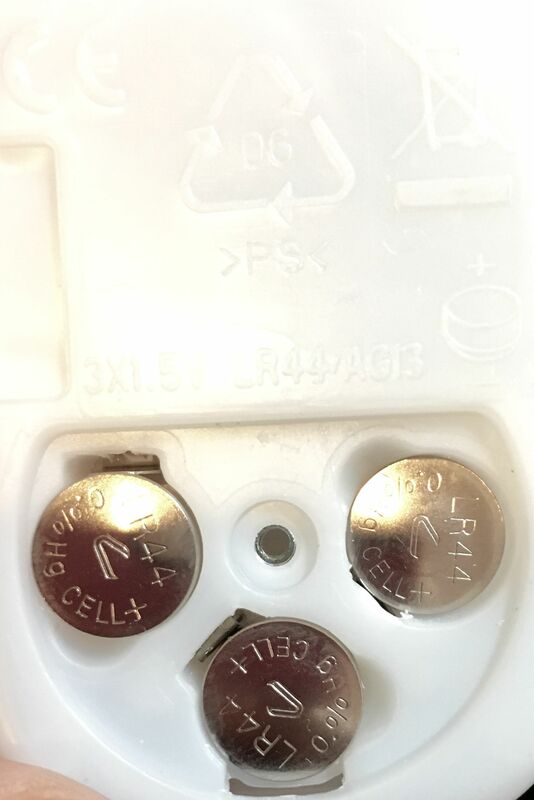 Here is an example of what the batteries look like and where they are located.